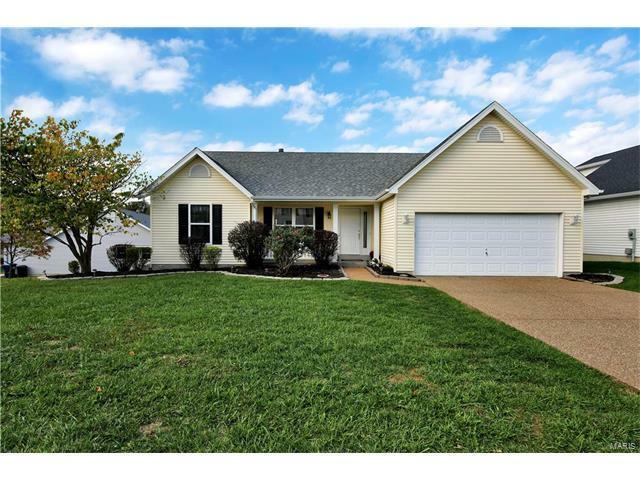 Wonderful 3 BR / 3 full-bath RANCH home w/ fully finished WO LL below! Fresh paint t/o & beautiful new flooring all through main floor (newer carpet downstairs too). Charming home upon arrival w/ its welcoming front porch & professional landscape all around & fully wood-fenced back yard; dedicated foyer spills into vaulted great room, light & bright, where windows flank & top the brick-front fireplace & hearth. Dining room also adjoins w/ WO slider to the newly updated wood deck & the open kitchen w/ its white cabinets, breakfast bar, center island & large bay window nook. Master suite is vaulted & spacious w/ windows, WIC, dual vanities, separate shower & luxury whirlpool tub. Support bedrooms are generous & share full hall bath. First floor laundry. Open staircase to rec, family, craft/office/sleep, storage spaces, new 40gal water heater, 3rd full bath! Custom blinds, newer roof, gutters, shutters, screens, much siding; prof long term pest control contract w/ records & transferable.